Many low-fat cookie recipes substitute cream cheese for butter. If you aren't following a recipe, you can experiment on your own with substituting cream cheese for some or all of the butter. You may need to adjust the cooking time and the method in which you store the cookies to ensure that the cookies are just as soft and chewy as the original version containing butter. Substituting cream cheese for butter can cut the fat of the cookies dramatically. Three ounces of butter contains over 81 grams of fat, 51 grams of saturated fat and 215 milligrams of cholesterol, according to the HealthALiciousNess.com nutrition database. On the other hand, a 3-ounce portion of cream cheese contains 28.6 grams of fat, 18 grams of saturated fat and 90 milligrams of cholesterol. However, cream cheese is slightly higher in sodium than salted butter, and it is much higher in sodium than the unsalted butter that is typically used in baking. When you are substituting cream cheese for butter, use a full-fat cream cheese. 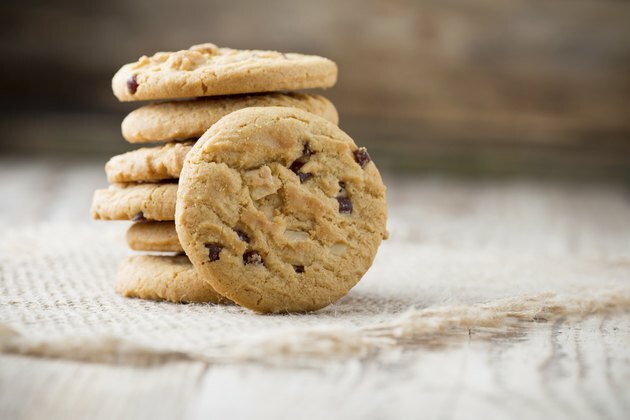 Cookies need fat to be moist and flavorful, and if you reduce the fat too much they will be hard, dry and have less flavor, according to Julie Van Rosendaal, author of "One Smart Cookie." Begin by using an equivalent amount of cream cheese for the butter in the recipe. If the resulting cookies are too hard, you may need to cut back on the amount of cream cheese and add some butter back into the recipe. Soften the cream cheese by allowing it to warm on the countertop. If you are in a hurry, remove the cream cheese from the package and warm it for a few seconds at a time on reduced power in your microwave. Add the cream cheese to the recipe at the point where the recipe calls for adding butter. Bake the cookies at the same temperature as you would normally. Check the cookies three to five minutes before the end of the cooking time. Cookies made with cream cheese may become firm faster than cookies made with butter. Cookies made with cream cheese can become hard when they are stored, so you may need to take additional steps to keep them moist. Place the cookies in an airtight container and add a piece of sandwich bread in with the cookies. The cookies draw moisture from the bread, which helps them remain moist and chewy. Replace the piece of bread each day to retain the moisture in the container. The amount of time the cookies can be stored depends on the type of cookie. If the cookies will not be consumed within three to four days, freeze the extras.